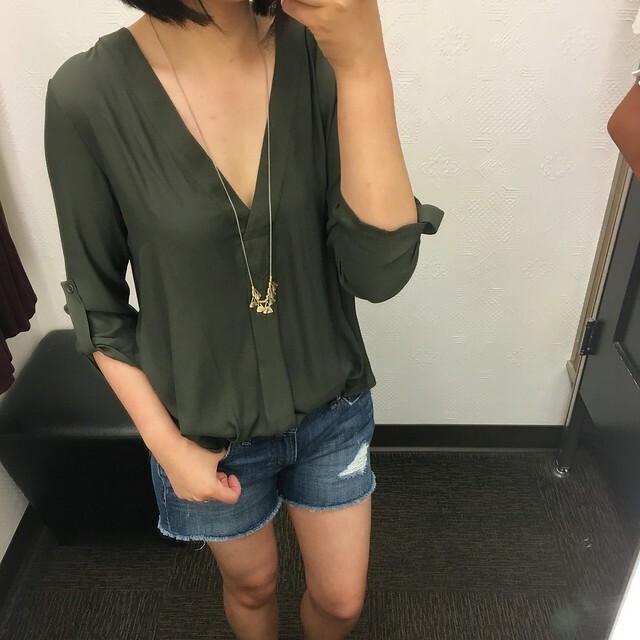 This Lush v-neck crepe blouse came highly recommended by a few fellow bloggers I follow but the length is really long. Refer to this clip I saved from my snapchat (username: whatjesswore) here. 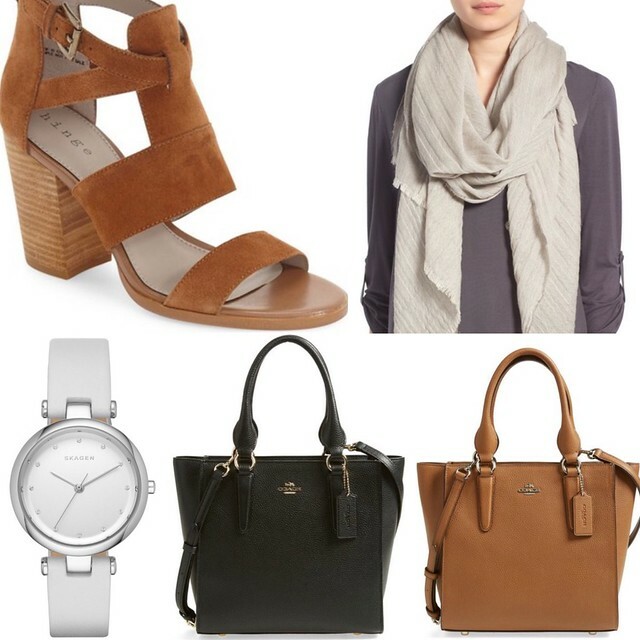 The v-neck is very low cut and you would need a layering cami to be decent. I also found the quality to be suspect since the one I tried on had a lot of loose threads at the seams. I’d say this top does run true to size as long as you’re not petite. 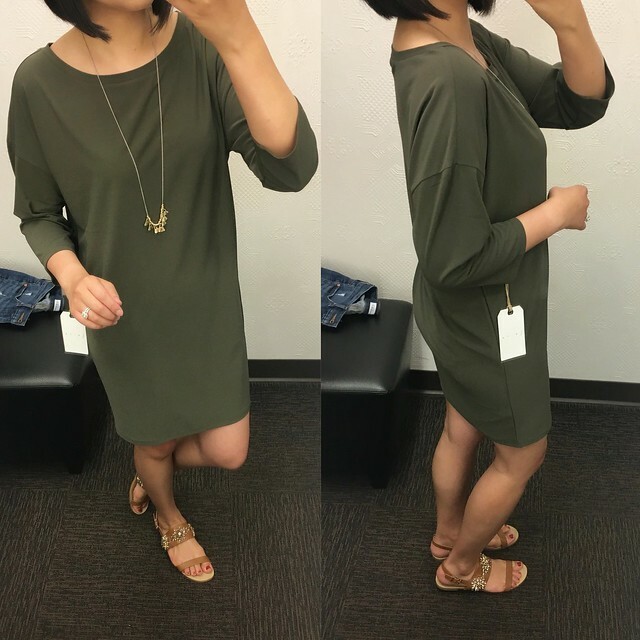 I love olive for the fall so I tried on this Leith dolman dress for size in XS but it was just too loose on me (refer to this clip to see how it fits me). It’s short on me hitting a few inches above my knees but it’s supposed to be a short/mini dress based on the stock image.The dress is unlined so you would need to be careful to wear seamless undergarments to avoid any visible lines. Size XS more like a size S so you may want to size down while still maintaining a bit of the slouchy look as designed. As mentioned in my previous post, I ordered this Socialite cowl neck shift dress in navy and ivory stripes after seeing the olive color on Jules. 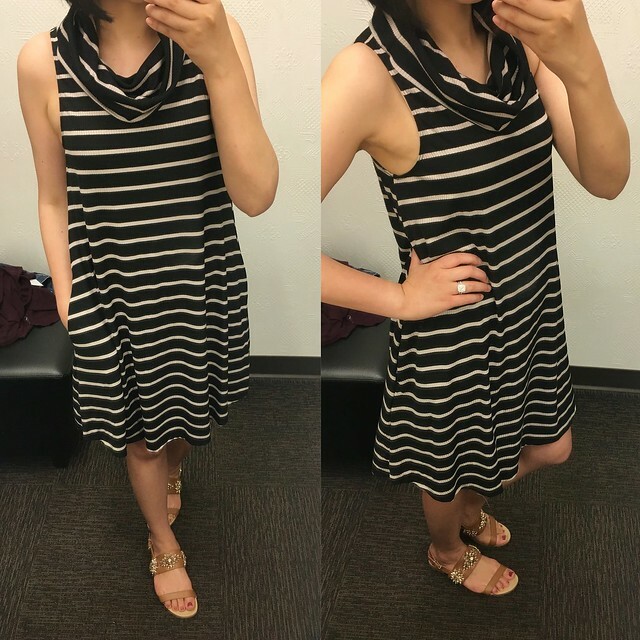 I was only able to find the black and ivory stripe to try on above and this plum color to try on below. The striped version has a rib trim texture to it as seen here. You can also refer to this clip to see better see how the dress looks like on me from different angles. The stripe version had slightly smaller arm holes than the solid version below. I love that this dress has pockets. Hopefully I will like the navy and ivory stripe color I ordered when it arrives in the mail later this week. The solid colors are made of a soft fabric and they have slightly more generous arm holes since I could clearly see my bra from the sides. 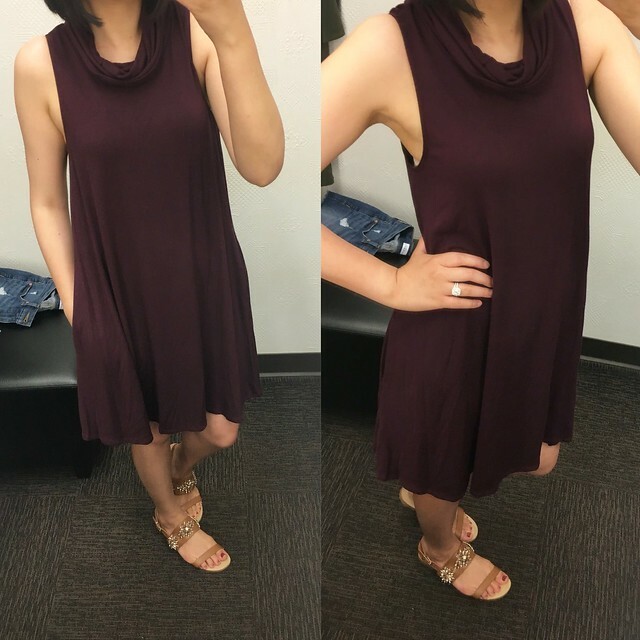 I usually have this problem with regular sizing since I am petite (5′ 2 1/2″). If you’re of average height then this probably won’t be an issue for you. Refer to this clip for another look at how this dress fits me. 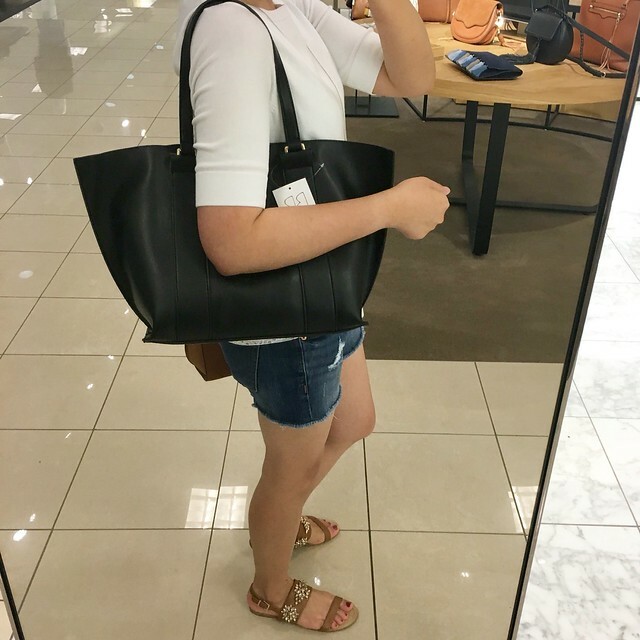 For some reason I couldn’t locate this tote online once I got home but I did find a similar bag by Sole Society here that is part of the anniversary sale. I ordered these Vince Camuto Katleen peep toe booties the other day but when I tried them on in store I wasn’t a fan of the darker color, they looked and felt clunkier on and personally I didn’t like the way the cut out vamp on the sides accentuated my ankle bone. I tried on size 6.5 and it was a tad snug and felt like a small 7 so I’d say these should run true to size for most but if you have more narrow feet then you may want to go down half a size. I ordered them in size 7 but since I don’t really love them. As of right now, I plan on returning them unless they somehow more flattering styled with jeans. Refer to this clip for another look at these booties on me. 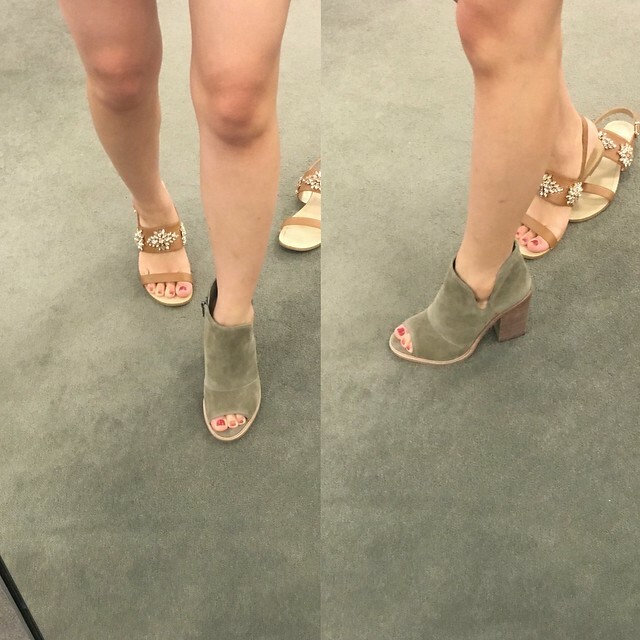 I forgot to take pictures but I was able to try on the highly recommended Vince Camuto Feina booties that online look similar to my favorite Vince Camuto Franell western booties from last year (review here). Unfortunately, I found the boot shaft to be too wide and unflattering around my ankles. Refer to this clip to see what I mean. Perhaps they would look better styled with jeans but against my bare legs I couldn’t see myself wearing them with my fall dresses and skirts. Saving the best for last – I tried on these Hinge ‘Cora’ block heel sandals recommended by Megan @thedarlingbrunette and I am obsessed! They had size 6 on display and I managed to squeezed into them for the above pictures. When I asked for size 7 to try on my local store didn’t have them but they were able to locate and ship them to me from another location free of charge. Hopefully you can chat with customer service to locate these since they’re currently sold out online. These sandals were my only purchase in-store today. As I’m writing and editing this post I just noticed that size 8 popped back in stock in the wine suede color. By the way, stay tuned for LOFT fitting room reviews in an upcoming post! I had shared a sneak peek of the blossom sheer tie neck blouse on my snapchat. I have a LOFT shopping party with my coworkers this week and I’m super excited.